Large Popcorn, No Butter: True Story: The Rules of Writing and the Meaning of "Truth"
True Story: The Rules of Writing and the Meaning of "Truth"
I'm just gonna say it: it's weird to see Jonah Hill and James Franco in roles where they're not telling inappropriate jokes and romping into each scene kicking up mayhem. However, they both seem to hold their own in True Story. And they're not even telling potty humor jokes. Hill plays Mike Finkel, a writer for the New York Times. When Finkel compromises the verity of a story that he's written, he's immediately fire from the famed newspaper. But not long after he's moved back to Montana (who the hell decides to move to Montana, btw? ), he receives a strange phone call. The man on the other end informs him that a child murderer has been arrested and that he was found to be using Mike Finkel's own name. Finkel then meets this killer, Christian Longo (Franco), and decides that there may be something to be discovered here. He then dedicates himself to the task of attempting to tell Longo's own version of the story. With a book deal in the mix, he may be able to salvage his writing career. But getting close to Longo proves to blur the lines of truth. Can he really trust this guy? And what is it about him that reminds Finkel so much of himself? Honestly, I was impressed by these two performances. 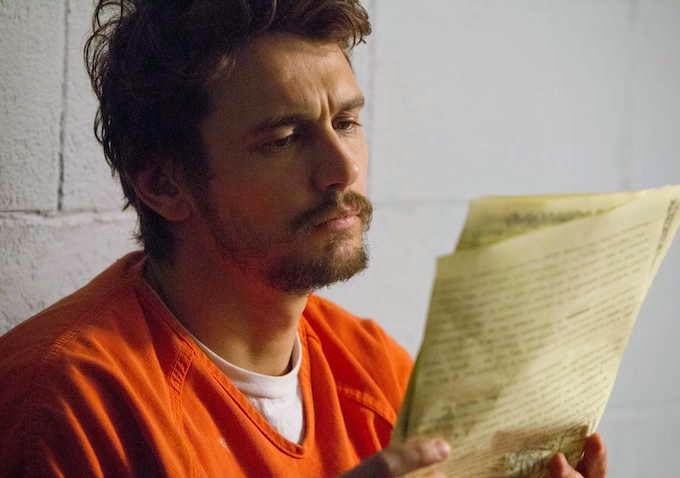 Franco has a tendency to act in a variety of roles and Hill is starting to get more and more attention with each movie that he comes out in, but these roles were pretty tricky to nail and both actors come out on top. They're deceptively subtle, each of them. Hill is believeable as the ruined journalist looking for a way out and finding it in a man who is creepily like himself. And Franco's likeability sustains throughout almost the entire film, until you get towards the end and the horror of what he's done resurfaces. The movie's big question seems to be about telling the truth. Finkel gets fired from the NYT because he's embroidered upon a story about impoverished young children in Africa in order to buy them more attention (he says). 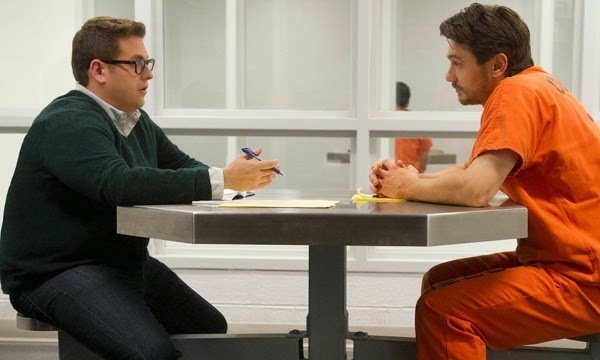 And then the rest of the movie is dedicated to trying to figure out whether Longo is innocent or not, through his 80-page letters, deep conversations, and other interactions with Finkel. It isn't until the story begins to taper off that we start to realize the true character of Longo, and that makes the end of the movie pretty damn creepy. The title and backstory of the movie are also delightfully meta. The story of Mike Finkel and Christian Longo is incredibly true. But is True Story really a true story? How true is it? How much can we trust the verity of biopics and stories that claim to be true if they're spun into a form that's meant to entertain and engage as much as it is to inform? And it's those questions that make the film so thought-provoking. Good stuff and hats off to Hill and Franco. 7 outa 10. Nice write up! I really want to see this film. I'm hoping my theater gets it this week. I've heard a lot of mixed things about this, but it's nice to read some good ink! I am a fan of Hill, despite those who don't care for him. I'll need to check this out. I'm still not 100% sold on Hill. I think he conveniently chooses roles that suit his character in real life, but he's pretty good in this so I'll throw him some credit.